Discussion in 'Star Wars: The Force Awakens' started by Disneylandfan4life, Dec 15, 2015. ^^^^^^^^^^ THIS IS THE GREATEST THING EVER! Both soooo DRUNK! Soooo many swears! This deserved it's own thread. LEGENDARY! his face was like, OH! MY GAWD it is LIVE!!! This was the funniest thing I've seen for a very long time. Mark, Carrie, Harrison, John, Daisy, Oscar.... they all look sincere how they enjoyed the experience being in the movie. They are having great fun, and are excited about it.... this is a truly great sign of things to come. Carrie is fantastic.... she's been each time she's been interviewed. Why do they keep giving her a live mic when she is drunk? hand carrie fisher a mic on live tv, what is the worst that can happen? got to imagine someone in production was just screaming no,no,no,no! I imagine production has an emergency button that all the interns always wonder about until the time comes someone hands a mic to drunk Carrie. Someone hammers on the button and all these red lights start flashing and a siren is wailing. By the way, the George Lucas interview was strange, I guess he don't gives a blast also. It looked like he don't wanted to be there. Maybe they should leave the man alone. That was cringeworthy and hilarious all at once. The interviewer was at a complete loss. 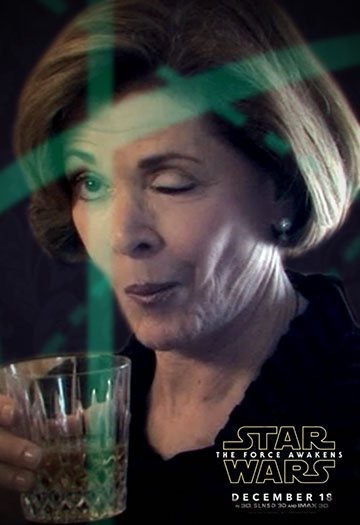 I assume production had a 5 second delay button... but Carrie Fisher drank it. It was weird, but I kind of liked it. Seems like someone has a little crush on Carrie...After all, that person said that he went back and forth to her trailer at the press conference. Also, I really didn't see all that much swearing. I saw Carrie swear, but that's all I saw. It's really hard to tell if she was drunk. She acts that way all the time. But Oscar, yeah, he seemed to have hit the bottle a bit. That simultaneously made me want to look away in awkward amazement and have a beer with Oscar Isaac and Carrie. Updated with New Videos! D23: Carrie Fisher and Mark Hamill Officially Become Disney Legends! Recap of the Panel.